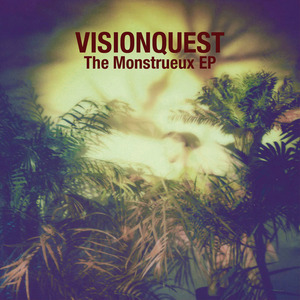 Rather surprisingly, the Monstrueux EP is actually the first collaborative 12" from the trio that now fronts Visionquest, namely Shaun Reeves, Ryan Crosson and Lee Curtiss. They quickly hit their stride, impressing with the tropical-influenced synthesizer lines, tactile electronics and rolling drums of future deep house anthem "Monstrueux". Jenny Mayhem adds her vocal touch to "Could Be", which sounds like a bass-heavy fusion of Visionquest's usual powdery house, and the more funk-fuelled exploits of Soul Clap. Finally, Tuccillo lends a hand on the nu-disco-goes-tech-house shuffle of closer "Modulant", whose flashing beats are expertly combined with a bubbling synthesizer bassline.